Upcoming plans include allotments for upgrading Alexandria Park (improved irrigation and storm water management and upgraded change rooms) and Perry Park (active and passive recreation areas and some contamination remediation). Coming soon are new Village Plans, a response to input from the community last year and the changing demographics of the City, to be followed by Social Sustainability Plans. The current Village Plans are being revised because of changes in population trend, in particular, people traditionally moved out of our area to the suburbs once they started a family – that is no longer happening. The meeting noted that the concept of Village does not work well for Alexandria; there is no central shopping/activity area. The new DA for auction centre is a vast improvement on the original DA. It addresses almost all of our concerns. It keeps the current shell, which will be stripped back to brickwork. It moves the driveway away from the corner, and widens it. It addresses the concerns around overshadowing, internal light and the ratio of small to large units. It is a much more visually attractive proposal that fits better with the heritage of the surrounding buildings. it is still too large – it is still a four story building with an FSR of 2:1. The driveway is still quite close to the corner – inevitably , given the site layout. It should be fine for left-hand turns, but to permit right-hand turns in or out would be dangerous. We will be sharing both these concerns with Council. Even if the plan goes through as is, it is still a win for the community, and a reminder that the prescribed 75m notification radius leaves residents at risk of not being informed about developments that will impact upon them. Pepe Clark told the meeting the the New Planning Laws are a serious risk to the environment and to long standing community rights, and that the government needs to hear that this legislation will cause problems for the community and will be deeply unpopular. The 2011 Independent Review has been ‘cherry picked’. There are many mechanisms for developers to appeal against decisions they dislike, and no opportunities for ‘3rd parties’ such as residents or councils. The objective is that 80% of applications will be deemed “compliant” or “code assessed”, including developments of up to 20 town houses, industrial buildings the size of two football fields, anything deemed to be in a ‘town centre’, subdivisions and rezonings. National Parks and Reserves and Nature Conservation Areas will be combined into a single category. Environmental Management and Environmental Living zones – which currently allow low impact development only – will be abolished, becoming general rural and general residential instead. Ecologically Sustainable Development will be replaced by Sustainable Development. This means that development will no longer be subject to the ‘precautionary principle’ (if an action or policy has a suspected risk of causing harm to the public or to the environment, in the absence of scientific consensus that the action or policy is harmful, the burden of proof that it is not harmful falls on those taking an act). There are still local plans, but they must comply with the overall state plan and can be overridden by the Director General, much as the Planing Minister used to be able to bypass the approval process using ‘Part3A’, but without judicial review – decisions, even if unlawful, will not be subject to judicial (legal) review. “This puts Part 3A in the shadows”. Residents were encouraged to spread the word, to write, email or best of all to phone their local MPs, local Councillors, Minister Hazzard and the Director of Planning. Councillor Linda Scott also addressed the topic: I’m a Labor Councillor. My party is in the middle of a crisis because of planning. Reforming the system so that less eyes are on planning is incredibly concerning. We need more transparency, not less. My local childcare centre in Erskineville has 560 kids on its waiting list. At peakhour we can’t get on trains. Our schools are bursting. We can’t have more development without infrastructure. We need investment in infrastructure. Proposed NSW Planning Laws – be afraid, very, very afraid!!! 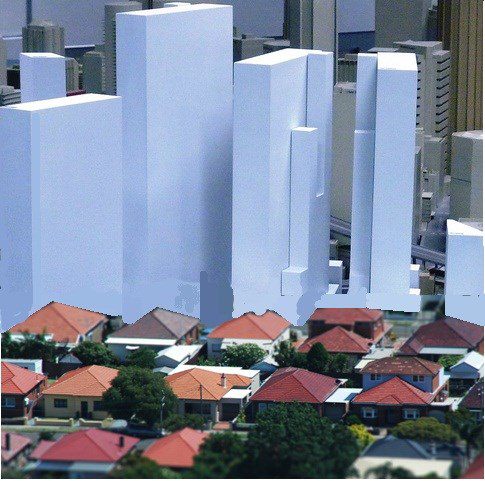 The White Paper for the proposed changes to NSW planning legislation has been released. After consulting independently some time ago, the NSW government ignored recommendations within that original report and produced their own “Green Paper”. Following the Green Paper, the “White Paper” now has been released for public comment. And although the document is open for comment until 28th June, the legislation already has beed drafted. So much for consultation!!! Everything in this White Paper emphasises “economic” aspects of the proposed plan. Environment, heritage and social aspects are either non-existent, or very much regarded as third-order priorities. And once initial public consultation is over (if you don’t get involved, you’ll regret it), no further public consultation or engagement occurs. Within 5 years, the NSW government expects that 80% of all development applications will be regarded as “compliant” and so no further consideration or discussion will be held – decisions will be taken away from Councils, and the community. Multi-storey developments may be planned on your street and you won’t know until building starts!! If a developer wishes to change a zoning, they will have up to four separate opportunities to apply and appeal, at different levels of the planning process. Finally, a developer can apply to the Minister for approval. During all these stages, you, as residents, have no right of appeal, review or comment. Residents need to be concerned, need to be informed, and need to be involved. Take action NOW to have your view heard. Tell your friends and family – this will affect them too. This has state-wide implications – not just inner-city areas such as Alexandria. The Better Planning Network has prepared an assessment of the proposals, and a guide to help you frame your objections to the NSW government. The Better Planning Network is an affiliation of some 380 community groups across NSW, and is a great source of information. Please visit http://betterplanningnetwork.good.do/nsw/email-the-premier-2/ to inform yourselves. The NSW Planning Department website is at http://www.planning.nsw.gov.au/newplanningsystem. Take time to read and inform yourselves of the content of this document. It WILL affect you, and potentially, quite adversely. The Central Sydney Planning Committee on Thursday 9 May 2013 will consider the report on the revised planning controls for the Ashmore Precinct. This report recommends that the draft planning controls are put on public exhibition. A copy of the report and associated attachments are now available for viewing on Council’s website at the below link. The Ashmore report is Item 7 on the agenda. If you wish to speak at the meeting, you must register with Council’s Secretariat Unit by phoning (02) 9265 9190 no later than 12 noon on Thursday 9 May 2013. The next meeting is to be held this coming Wednesday, the 8th of May, at the usual time and place of 7pm at Alexandria Town Hall, 73 Garden St.